I started my search for cool shoes with the keyword 'organic'. This became 'organic hemp', then 'organic unprocessed hemp.' I found some that were pretty awesome, but not for sale or under production. These were what I could find. 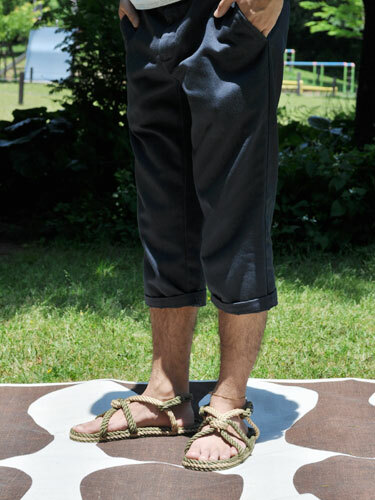 On one hand, they look totally paleo and comfortable. On the other, I'm basically walking on plastic water bottles all day. What do you guys think.. good enough / not an issue, or toxic plastic? I've attempted it several times with pants, but I just can't get the mechanics correct. At the gym, I saw a guy walk up a 2x4 with no rope/chalk/gloves and coconut-tree-climb to the top.. he just grabbed the board, leaned back, and walked up it. I'm thinking the polypro would be lightweight and silky (better than my current leather flops.) The reviews are mostly 5/5's "these are the best sandals" type of comments. The unprocessed fiber.. perhaps.. but I've heard your feet wear it in smooth and custom. I've been wearing leather ones, but they've been dying my feet leather color. (I suppose I could wear socks with them.) I'd go barefoot all the time if I could do it without having filthy feet all the time. Boots might be too much shoe for me right now. (My favorite shoe I've ever owned / worn is currently the Reebok Realflex.. that's my main workhorse.) Leather boots would probably be more Paleo though, good call. Why not buy some nice leather/snake leather boots or sandals? I have some leather cowboy boots that look great, fit amazingly and still make me feel as though I'm connected to the planet, since I'm wearing dead animal skin on my feet. As far as toxicity, they're probably fine. I do like the "Romano" style for men. Have you ever climbed a rope without chalk/gloves/pants? That's what I imagine these would feel like.